I've been busy with our company, but now they have flown home. They had to watch television by themselves at night because we are sleepy hosts and climbed the stairs early each evening. 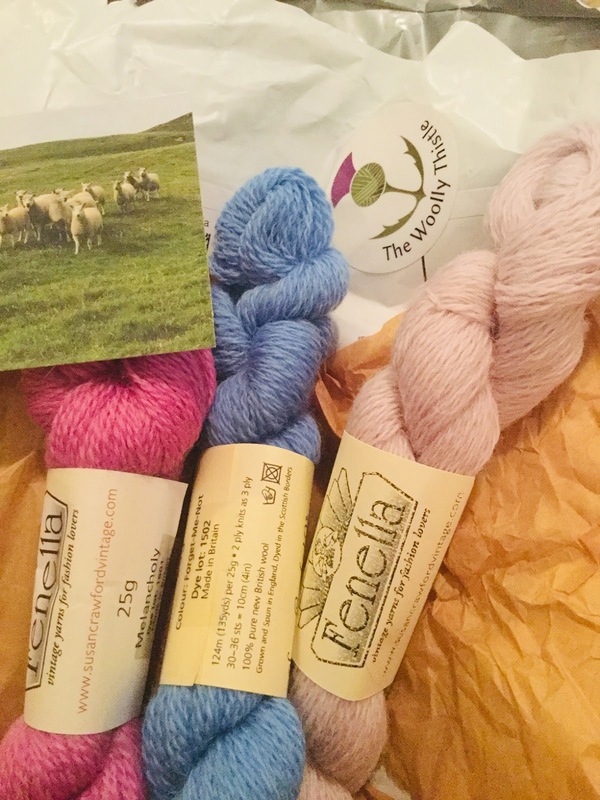 I read The Vintage Shetland Project by Susan Crawford (a huge treat of a book) and then I had to order some of her wool from The Woolly Thistle. Delightful. Look at the combo of festive stuff, Halloween trick or treat bags and Christmas wool balls! 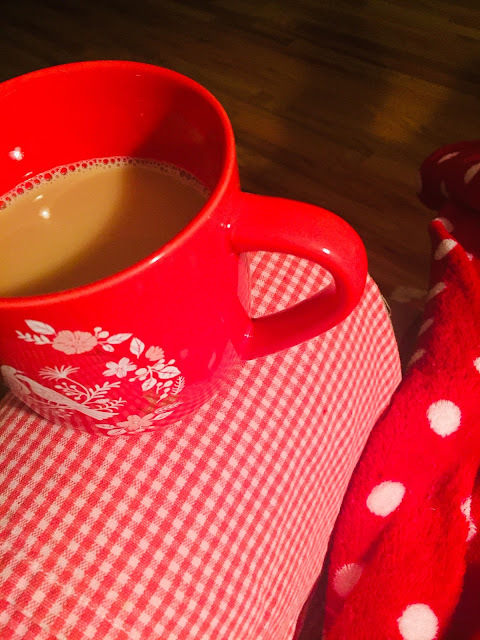 I've been watching Katie of Inside Number 23 (YouTube) and knitting away on my Norwegian colorwork jumper (smile).
. . . and drinking tea - yum! I took my brother and sister in law up to see Brad's gang. We loved worshiping at Brad and April's church. My brother and Brad had fun catching up. Christie is a master baker (I think!) and whipped up these lovely offerings on Saturday! Here is the Cozy King, relaxing on the heated blanket. 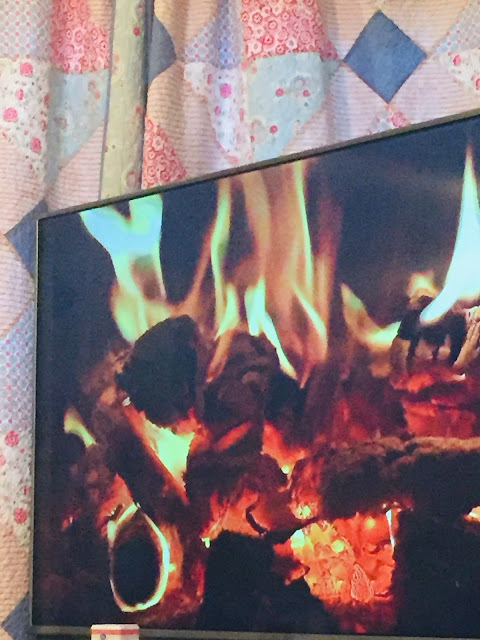 I've been tuning in to the fire video on YouTube since I can't have a fire (messy and wasteful) and I do love that. So cozy! White hair on my shoulder in BOTH photos of perching Timothy. I'm shedding, I guess. I am thankful for November. After being busy with guests, I feel like I am on holiday. Things have slowed and I can enjoy the festive build up. I might cook a turkey soon because we're going to Jenny's and Scott is going to smoke the turkey, so our house won't have that roast-y smell. Maybe I'll cook PART of a turkey so I don't have to wrestle with a carcass. What is your November going to look like? Will you read? Knit? Cook? Bake? Walk? Hug people? Thank you for coming by, calling in to say hello. YOU are kind. We'll probably go out for Thanksgiving, but I've got a turkey roast and the fixings on hand to make for myself so I'll have "leftovers"! ;) I hate wrestling with turkey carcasses, too, so I switched to turkey roasts years ago. What fun pictures. Love your funny brother! That pink and yellow bit you're knitting is gorgeous! Have fun with your "festive build up"! Your trick-or-treaters look adorable! James looks soooo serious. Garden of the gods looks like a wonderful place to visit. Nice that you had such a good visit with your brother and SIL. There is always some fun happening at your place and with your folk. How nice to have a good relationship with your older brother. Those trick or treaters were looking fabulous. Happy November to you. We've roasted one turkey early already. If we do another one it will be deep fried. Yikes. I've been to the garden of the gods, pretty neat place. Those baked goods look delicious and making me hungry. That is funny, that your brother and sister-in-law stayed up later than their hosts. I'm glad you went to bed to gather strength each night for the next day's hosting!! I am back home gathering strength now for Thanksgiving hosting... thank you for hosting ME and giving me an encouraging boost. "From strength to strength" - do you think? The trick or treaters are cute, including the littlest one. I hope they got lots of treats. You look tiny next to your big brother. I'm glad you had a nice visit. You are forever knitting and must be an expert by now. I still haven't knitted the thumbs on my mittens I started way back. That yarn looks divine. And that tea photo SO inviting! Beautiful countryside you visited. I'd love to see that in person. November -- well, art sale next week, Cork Poppers this week, a boatload of MRIs and Xrays and manipulation for my foot and back. And yes, reading, prepping for the holidays! All good. Blogger is giving me comment grief so if you don't hear a direct reply from me, forgive me. I'm posting my trip and seeing comments and loving them but don't know they're there till I check back in! Thanks for coming by! Your posts are always sweet and fun to read. The children are adorable, and James looks very serious as Spiderman. I am so happy that my youngest daughter has moved back to NC...only one hour between us now. She has asked us all to come to their house for Thanksgiving. Happy guests! Happy kids! Happy Cat! I'm quilting --making a quilt for my nephew's wedding in mid-November. We're going to that. Then Thanksgiving. Not sure if I'm cooking or going to my folks' house. It's getting cold, so a real fire in the wood stove is coming up! What a fun post . . . never a dull moment at your home. Wishing you a sweet day today and thank you for the sweet comment you left about my watercolor quilt. You warmed my heart. November has been too busy so far. Need it so calm down, haha! My mother used to roast a turkey leg to get that aroma in the house - with rosemary, and make a little baked stuffing in a dish to go with it. Then you don't have a whole carcass to mess with. So glad you had fun with your brother - that's special time. I too enjoy drinking tea - definitely yum! Lovely pictures of the children. Ooh, you HAVE been busy! Lovely you got to spend time with family. I giggled at your brother's facial expressions. What a joker! What IS the garden of the gods!??!? Nice to see Tim looking all cosy!!! My daughter used to live near the Garden of the Gods and I looked forward to visiting there but they've moved to TN now. Closer to me though, so that's very good. We all need at least one goofy sibling, right? I love seeing all the fun and joyful things you've been doing. That woolly yarn looks divine. Your grands are adorable and I love how into his role your little Iron Man is! Love the baking goodies! I haven't made poppy anything in I don't know how long. I must buy some poppy seeds so I can! We will be cooking on Thanksgiving. Excited about it (the food! the smells!) and dreading it (the work! the clean-up!) at the same time! Have a lovely week, Karen!